An essential survey for all interested in the pottery of the London area, this study charts the development, peak and decline of two ceramic traditions: the shelly wares of c 1140–1220, mainly city-based but reaching Scotland and across the North Sea to Norway, and the greywares of c 1170–1350, widely used in the city and even more so in its hinterland. 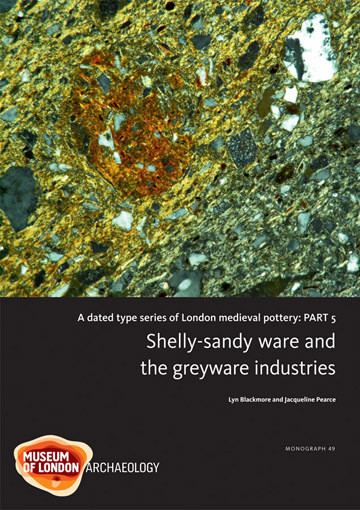 In addition to fabric analyses, form typologies, a gazetteer of find spots and scientific data, the study includes a summary of greyware production centres, and considers function, use, marketing of medieval pottery and the chronology of selected consumer sites in London and its region. MOLA 2010. ISBN 978-1-901992-93-9. Hb 334pp. 154 bl/wh and col ills. "It is the fruit of decades of research and excavation, and MOLA are to be congratulated for tenaciously seeing a project through…Anyone facing decisions about research frameworks in an urban context, selection and retention of artefacts, the reasons behind variation in assemblages, and the value of scientific analyses of ceramics has much to learn from this research…"
"It gives an insight into commerce both home and abroad, and the changing economy within which these pottery industries operated." "The presentation of the book maintains the traditionally high MOLA standard: conventional pottery drawings, colour images of pots, sherds and fresh sherd-breaks, are fully integrated into the text, as are distribution maps and supporting tables."